As I arrived at the entrance of the Pench Tree Lodge (Pungdundee Safari), I was pleasantly surprised. There were more trees than construction around me. There was a huge Mahua tree right behind the reception. In the hot month of June water bowls were kept for birds at various places. The entrance gate is lightly constructed. Other than the reception there is a dining hall and then there are 6 tree houses. Other than that there is Jungle around. I loved the setting from the word go. It was so light on construction and big on trees! To reach Pench, I landed at Nagpur Airport and then it was a road transfer of 3 hours to Madhya Pradesh. Seoni, spelled Seeonee in Jungle Book is in Pench. After lunch, we started for Sukhtara Village as it was the day of the local haat (market). We were probably the only tourists around the whole haat, it was a lot of fun! We did birding all the way to Sukhtara and back. It was possible because there hardly any traffic on the road! 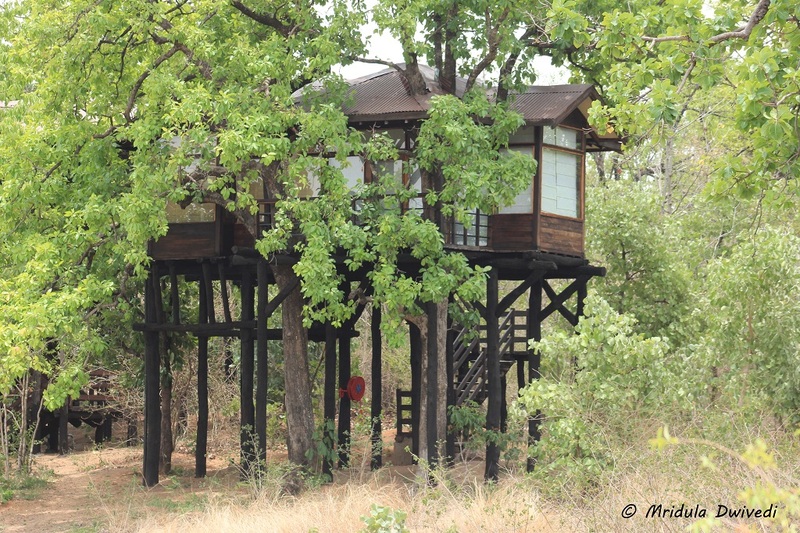 Our tree house was built next to a Mahua tree, the branches came right into the veranda. Squirrels and birds were fond of the tree too. The tree house was comfortable. 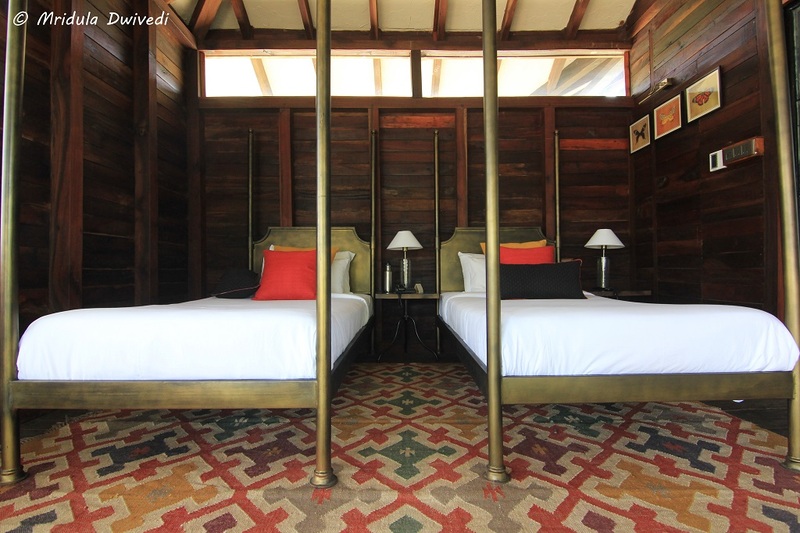 It had twin bed, I was sharing the room with fellow blogger Neelima Vallangi. The bathroom was large and comfortable. The best part of the tree house was if we raised the curtains the Jungle came closer to our room! It is prohibited to bring eating items in the tree house as it attracts rodents and you would not like to share the room with them. Similarly one should not leave the doors open or monkeys and other creatures would come in. 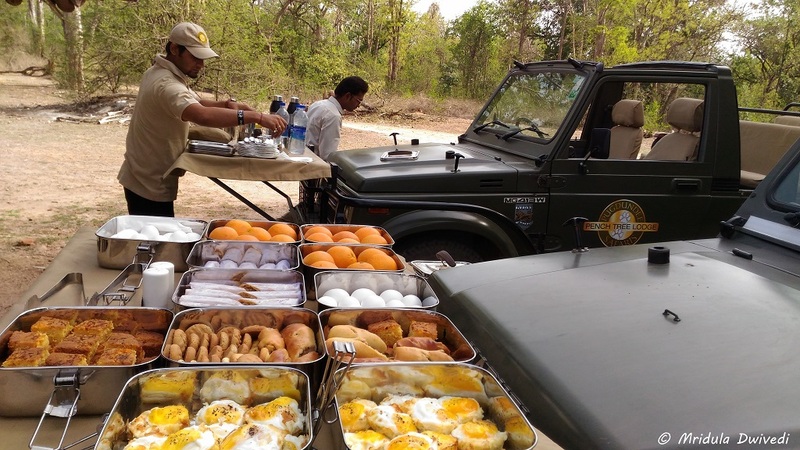 The food at the Pench Tree Lodge is excellent. I enjoyed all my breakfasts. They served both Indian and Intercontinental cuisine, however I was partial to the Indian cuisine. I will remember the local drink made of Mahua for a long time. I stopped at one, which is all I could handle of the hot stuff! 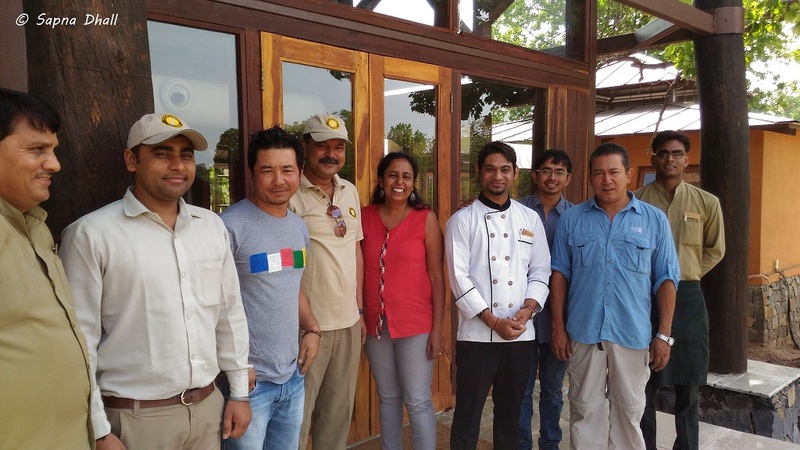 The staff at Pench Tree lodge was courteous. I particularly remember Mukundi and Negi ji for feeding us with care. As we were in the Jungle the Airtel net connection was not too good. I would not mind it at all but I had some work which could not wait. Make sure you do not end up in the same position as me. Collarwali with her Cub on the Evening Safari! 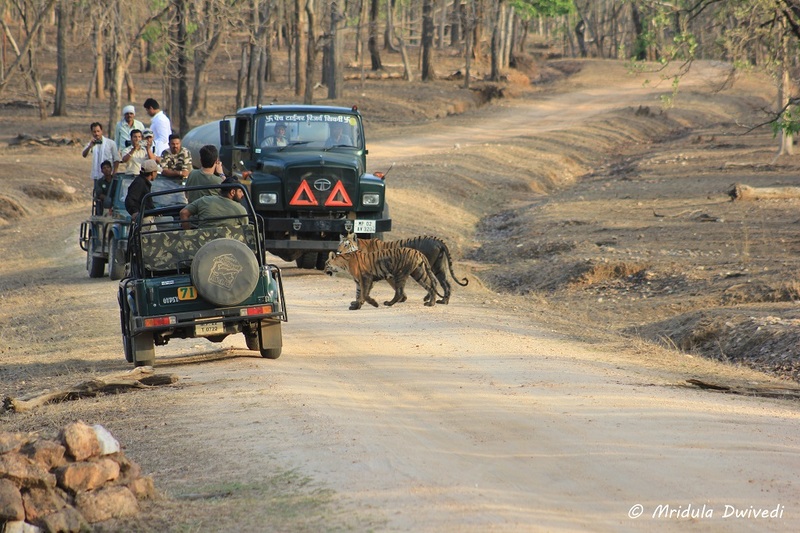 However, the star of the show were the safaris to the Pench National Park. We did an evening Safari and a morning Safari and it rained tigers! In the evening we spotted the collarwali tigress with her cub! I was ecstatic as this was my second sighting of her! Little did we know that the morning would be even better! 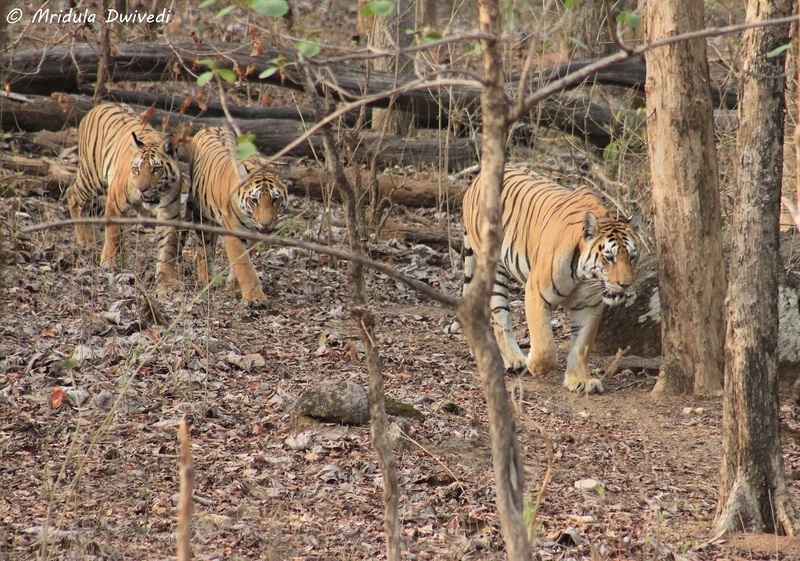 Collarwali with her Cubs on the Morning Safari! We were birding mostly thinking that our tiger quota was exhausted the day before! We came to a spot and realized that there were tigers around. We were the latecomers but then due to some quirk of fate our jeep became the first in the queue, we were directly following Collarwali and her two cubs! The Forest Office asked us to stop and let others have a view after a while. My then I had anyway watched them to my heart’s content. It was the best tiger sighting of my life at least till date! I know there is much more to the Jungle than the tigers, like spotting wild dogs. The pack was actually bigger than what I managed to capture. 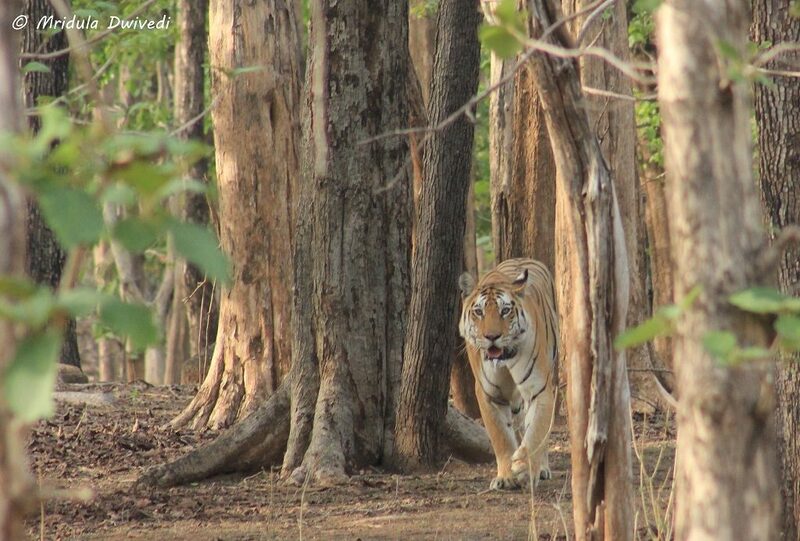 Pench National Park in Madhya Pradesh is stunningly beautiful on its own. With fading light and a peacock it looked dazzling. As I said, We spotted wild dogs, peacocks, Indian Pita, spotted deer and much more but this time with the Pench Tree Lodge we were extremely lucky with the tigers too! A Big Thank You to the Pugdundee Safari Team! 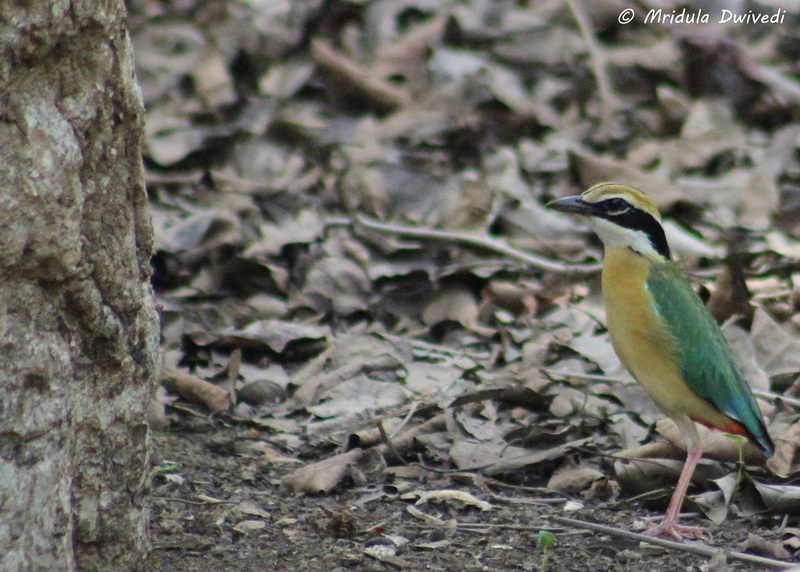 A big thank you to the Pugdundee Safaris team at the Pench Tree Lodge from my side. It was a truly memorable trip! 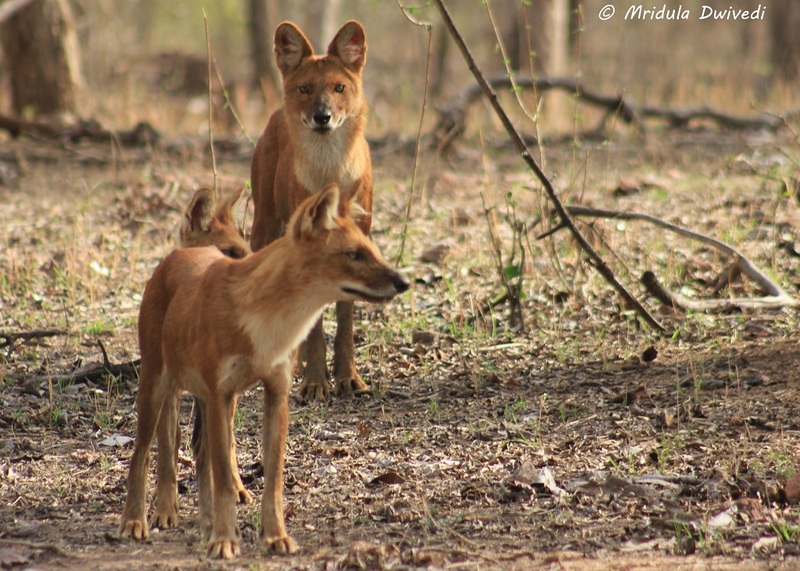 Before I close this post, here is a video from the Pench National park’s Collarwali and her cubs! PS. I was invited by Pugdundee Safari to visit the Pench Tree Lodge. The Usual London Pictures- Gazillion Plus One Times Srilankan Airline- Blogger on Board! 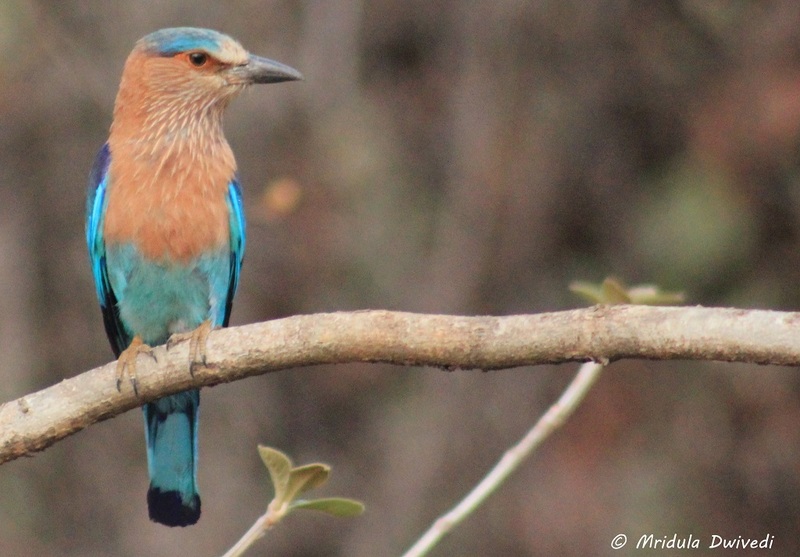 Thank you Prasad, the bird is so colorful and the picture so not what it really looks like! Wow! Such a thrilling trip. Enjoyed reading about it. Loved the pictures and the video. Had goosebumps while reading this, loved the tree house. Hope to stay in that someday ! Thank you Ruby, I hope you will stay in one soon! No words to describe this… its just awesome !! I so agree with you wildlife belongs to the jungle! Ah true that, we are confined to the jeep here and they roam around majestically! 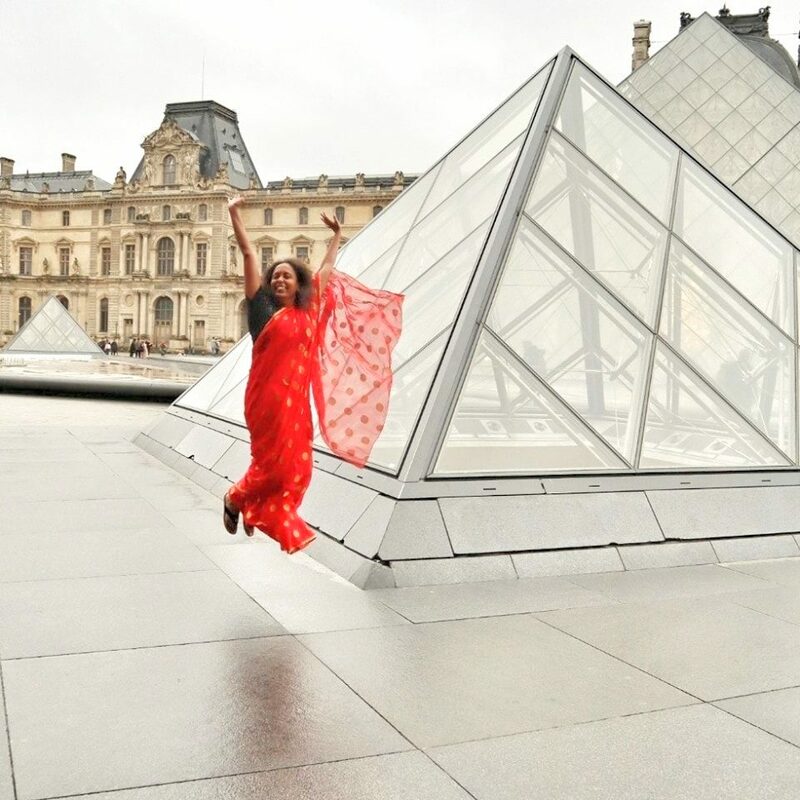 Gorgeous place and stunning photos Mridula. Excellent captures of nature there! Yes Divsi, this was my first tree house stay too! Lots of fun! Two safaris one in the evening and the other in the morning! Awesome pictures! A beautiful post! Simply Amazing. Are tiger sighting normal or were you extremely lucky? Tree house looks fantastic. Pench seems to be special for me. I have visited it twice and seen tigers on both the occasions! Luck certainly plays a role, there have been many safaris and national parks where I did not see a tiger! But then I like going to the jungle anyway, so the tiger is a bonus. 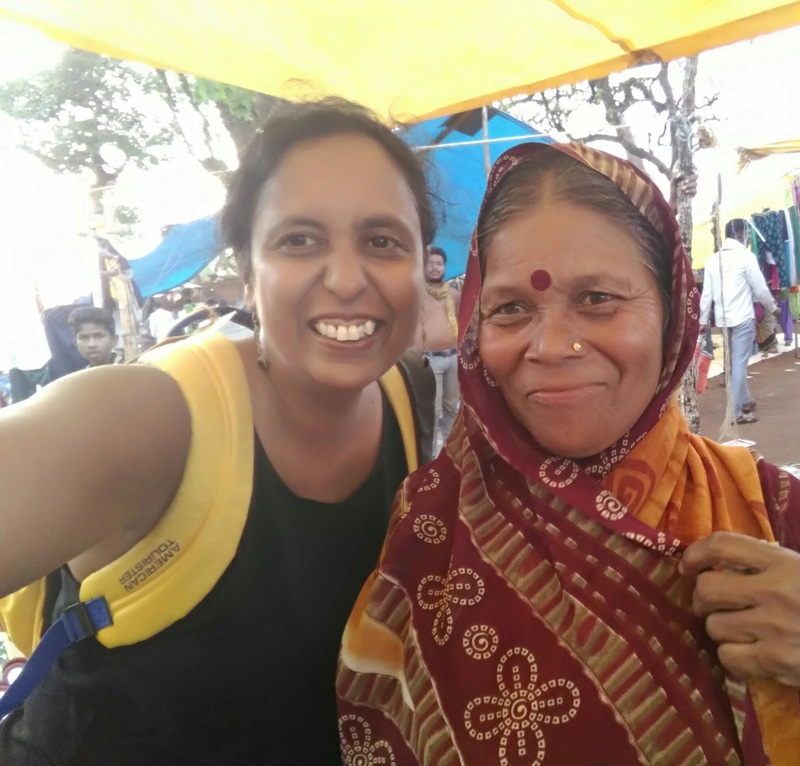 Wow – what a fabulous experience! Looks like someone ate you comment mid way!